Offered for your consideration is this spectacular Comins Classic. 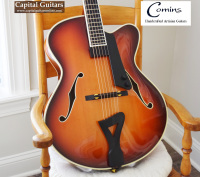 This magnificent instrument was hand-built by the very talented Bill Comins in his Philadelphia shop where he has been crafting ultra-high quality archtop instruments for decades now. 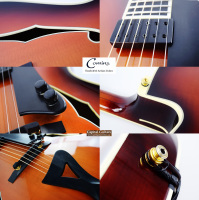 This Classic is an acoustic archtop with a 25" scale length and a body that 3-1/8" deep and 17" wide at the lower bout. 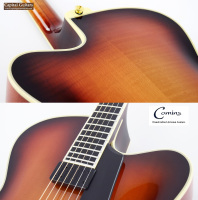 It has a straight grained Spruce top with X-bracing. 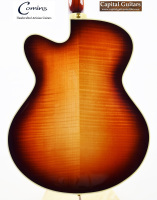 The back, sides and neck are made of nicely flamed Maple. 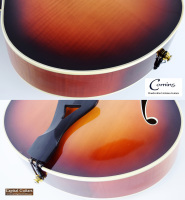 The neck is a three-piece design and has a sleek, low oval shape. 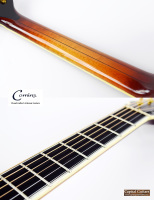 The fretboard is made of black Ebony, with a 12" radius and a 1-11/16" nut width. 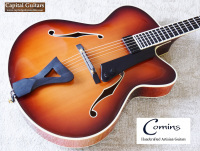 It is equipped with a Kent Armstrong suspended pickup along with an Ebony pickguard with volume and tone controls. 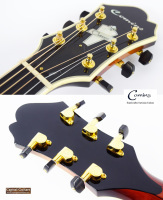 It has a floating bridge and Ebony tailpiece. The tuners are gold Sperzels with Snakewood buttons. The cosmetics include dual F-holes and wood binding and purflings. It is beautifully built and equipped. If you like your tone warm and creamy, this guitar will have you drooling all over yourself. Please check out the brief sound sample provided. The guitar was played with flat tone settings through a Fender Princeton amp. This guitar has voice that is smooth as silk, even equipped with the phosphor bronze light gauge strings that I prefer. 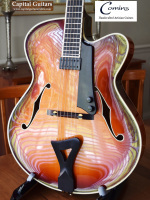 With flat wound jazz strings installed, this guitar's tone would be even warmer. It plays smooth and easy too with a fast neck that begs to be played. The more you play it, the more you will appreciate the details that Bill has put into this fine instrument. This hand-built beauty is in what I would classify as "excellent minus" condition. 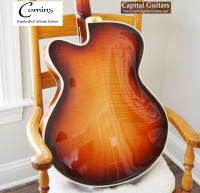 The worst flaw, which is is not easily seen, is on the lower edge of the guitar's top and resulted from an unfortunate ding from the latch of the case (see photo). Otherwise, this guitar shows only very light play wear and the frets remain is excellent condition. It comes in it's original TKL case which is in very good condition. A new example of this guitar will cost you nearly $11K. This well maintained 2002 example can be yours for thousands of dollars less. 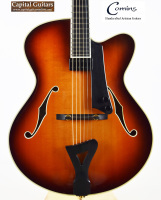 This is an ultra-high quality jazz guitar made by one of America's best archtop builders. 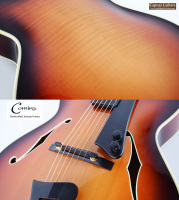 Click the 'Buy Now' button and make this magnificent instrument yours today!